Are you on the hunt for the best pizza is Hoboken, NJ? Everyone loves a hot, gooey, and cheesy slice of homemade pizza. There are so many delicious toppings you can choose from. Pizza is a dinner you can really get creative and playful with. Best of all, kids love pizza and it’s a no-fail dinner option for the entire family. New Jersey has some of the best pizza in the country (or the best according to many people). Hoboken is home to some of the most fantastic, fresh, and scrumptious pizza pies in the state. With so many places to choose from, and tons of options constantly popping up all over the city, it can be tough to pick out the best pizza in Hoboken, NJ. Luckily, we have compiled a list of the best pizza places to make your search for a pizza place quick, simple, and easy! If you are looking for some of the best thin and crispy crust in town, look no further than Grimaldi’s. They are famous for their coal brick oven pizza, real mozzarella cheese, and fresh toppings. Their pizzas are cooked in a 1000-degree coal oven, which creates the crispiest crust and gooiest cheese. You can choose from traditional style pies to pizzas topped with garlic, ricotta, buffalo chicken, veggies, and tons more. Johnny Pepperoni’s has a super laid-back atmosphere, making it perfect for taking the whole family out for pizza night. They specialize in thin crust pizzas with crisp crust as well. For the parents, choose their delicious clam pie (fresh mozzarella, chopped clams, parsley-basil pesto and chili flakes) and a traditional cheese and sauce pizza for the kids! 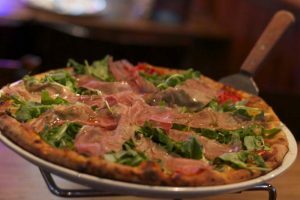 Napoli’s Brick Oven Pizza features true Neapolitan style pizza. With tons of pizza to choose from, there will always be something new to try and a little something for everyone to enjoy. Of course, you can choose from their traditional style pizzas and toppings. However, you can also explore some of their fancy and fun options as well! Indulge in their chick, bacon, ranch, chipotle chicken, spinach and artichoke, and much more. Their great menu combination is what awards them as some of the best pizza in Hoboken, NJ. Of course, they offer up some seriously amazing and unique pizzas. Try their “secret” taco pizza. If you are feeling adventurous, try their GENERAL KHAN. This pie has Mongolian style General Tso’s spicy sweet & sour peanut sauce, Asian fried chicken with toasted sesame seeds, mutz & scallions, and heaps more funky pizza flavors. If you are truly looking for a different pizza experience, you must make a stop through Tony Boloney’s. Beautiful Artisan hand tossed pizza is what you will get from the wonderful Panello. They offer a very warm, welcoming, and friendly atmosphere, making it the perfect spot for the family. Try their Verde Bianco Rosso. It has “fresh mozzarella, tomatoes, lightly lemon-dressed arugula, grated Pecorino Romano, topped with Prosciutto di Parma.” Maybe sink your teeth into their Kale-abrian pie. The pie has, “ricotta, fresh mozzarella, ‘nduja Calabrian hot sausage, kale, extra virgin olive oil, grated Pecorino Romano.” For their kids, stick to their Margherita or Marinara style pizzas. Whichever kind of pizza you choose, you will be eating some of the best pizza on Hoboken, NJ. Being in business for over 40 years, Benny Tudino’s Pizzeria cranks out some of the best pizza in Hoboken, NJ. They know a thing or two about making a killer pie. Benny’s offers all of the traditional style pizzas and toppings you can imagine like meatballs, pepperoni, mushrooms, veggies, sausage, and more! 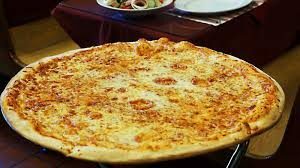 With over 21 years in the pizza making business, Margherita’s Pizzeria will not disappoint and is definitely some of the best pizza in Hoboken, NJ. Family owned and operated, the atmosphere of this pizza is super family-oriented and perfect for dinner out with the whole crew. A sports bar and pizza place in one, this is a great place to watch your favorite sporting even on the weekends. Although you may want to leave the kids at home with their babysitter for this one! Urban Coalhouse has some of the best atmosphere and best pizza in Hoboken, NJ. Their pizzas and other foods use the freshest ingredients to ensure all food is high-quality and delicious. They offer pizza options like a white pie, vodka pie, cauliflower pie, and spinach and artichoke pie! If you are going for lunch or dinner with the kids or if you have baby in stroller, you have tons of options in the mile square city and if the weather is good, do enjoy sitting in the patio. Specially Washington street has many restaurants with outdoor sitting options. There plenty of options If you are following some diet restrictions or if you do not eat meat, you can still go ahead with the plan without thinking twice as the options are plenty and you would not get disappointed.